Antoni Macierewicz was the keynote speaker at a Center for the Study of Statesmanship (CSS) event on Monday, February 26th in Heritage Hall. Macierewicz has served in the Polish government as the Minister of Internal Affairs, Head of Military Counterintelligence Service, and most recently, Minister of National Defense. Introduced by politics professor and Founding Director of the Center, Claes Ryn, and Archbishop Emeritus of Washington Cardinal Theodore E. McCarrick, Macierewicz’s talk was entitled “The Atlantic Alliance and the Future of Europe: Sources of Unity and Division,” with a panel discussion and question session that followed. His main points focused on the importance of NATO in European relations, the threat Russia, Israel, and the Middle East pose to international safety, and how a Christian relationship between Europe and the United States would be mutually beneficial. Macierewicz began his presentation by reflecting on his trip three years ago to Rutgers University, where he spoke on an essentially identical topic. Since then, he said, he has been successful in placing more American soldiers within Poland, and hopes that this trend continues under the new Defense Minister, a position he was removed from in January. He still sits on the Parliament of the Law & Justice Party, the right-wing populist party that has majority rule in the country. Macierewicz stressed the importance of a Trans-Atlantic alliance between the United States and European nations. He suggested that Poland and the United States share a commonality— namely that neither needed to enter the Second World War, but they chose to fight because they were pushed by the Axis powers. Despite the fact that small portions of Polish citizens during World War II have been connected to the capturing or killing of Polish Jews, Macierewicz vehemently denied any Polish involvement in the Holocaust. He presented Poland as a victim, though history suggests this is not entirely true, as seen in events like the Jedwabne Massacre and the Kielce pogrom in which Poles were involved in the killing of Jews. Macierewicz offered scathing remarks about Russia, whom he compared to Germany in the 1930s, and called the Christianity practiced in Russia a “Russian myth.” He noted that Russian soldiers stationed in the Near East could be linked to Assad, and stressed the importance of the Holy Land, having visited Israel a number of times himself. 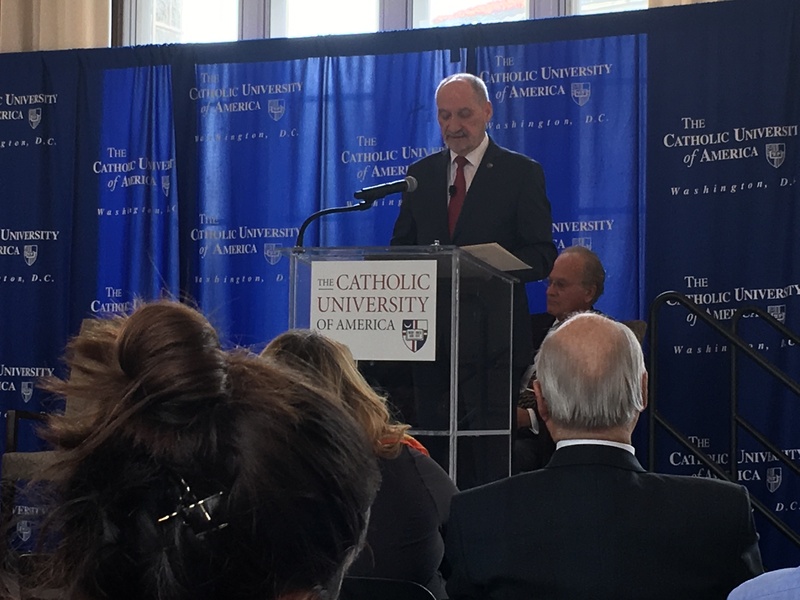 Throughout the panel, which gave Macierewicz an opportunity to answer questions unrelated to the topic of a Trans-Atlantic union, he posited his belief that Christianity is the key to the unification of Europe and the United States. He further emphasized his belief that Russia intends to dominate all of Europe. Though he has quite an impressive political resume, Macierewicz has not escaped controversy. Contention regarding his invitation to speak at the University stems not only from his denial of Polish Holocaust involvement, but also the amount of reports and cases alleging anti-Semitism. In 2002, Macierewicz said that there was some validity to a document entitled “The Protocols of the Elders of Zion,” a fabricated text that describes a plot by the Jews to control the world market and media. This document was proven false as anti-semitic propaganda early in the 20th century. He was the founder and editor of a far right newspaper called “The Voice,” which has a long history of running anti-Semitic articles and opinions dating back to the 1990s. During the panel, when asked about these accusations, Macierewicz quickly denied any such claims. There are also rumors that Macierewicz has secretly been in talks with the Russian government for years, despite his supposed disgust for Vladimir Putin. Macierewicz doggedly pursued Tomasz Piatek, the journalist who made these claims, attempting to jail him. Macierewicz’s appearance comes as current legislation from his governing party, the Law & Justice party, takes effect amid international controversy. Last month, Polish President Andrzej Duda signed a law which came into effect on Thursday, making it illegal to accuse the Polish nation or state of complicity in the Nazi Holocaust. The move drew sharp criticism from the United States and Israel especially, as critics find issue in how the bill might limit the freedom of expression and appears to be a nationalist effort to revise the perception of Poland and Nazi aggression in World War II. Israel says the bill will essentially criminalize basic historical facts and stop any discussion of the role some Poles played in Nazi crimes. The BBC reported that Israeli and Polish diplomats recently met in Jerusalem to try and resolve the matter as fears grew in Israel concerning a rise in anti-semitism because of the law. When asked about the status of the controversial Polish Holocaust bill, which at the time was frozen to be reviewed, Macierewicz answered briefly, acknowledging that the bill was being held up, but not taking a position on the matter. The current bill would give a fine or a penalty of imprisonment of up to three years for anyone who publicly accused Poland of involvement in Nazi atrocities. He added that the question might need someone who knows more about Polish history to inquire this of him. Immediately afterward, a Polish woman in the audience took the microphone and echoed Macierewicz’s sentiment, noting that one must first understand the history of the Polish state to ask about this time period. Following the event, a University professor who wished to remain unnamed expressed to The Tower some skepticism from faculty members concerning the decision to host Macierewicz. They have a problem with the school’s decision to give someone with this amount of controversy and alleged anti-semitism a platform to speak at the Catholic University of America. Stephan Kuttner, a former professor of Catholic’s School of Canon Law, where an endowed chair is named in his honor, fled Nazi Germany in the 1930s and then taught at Catholic from 1940-1964. His son Ludwig Kuttner wrote to The Tower expressing great frustration in the university’s invitation to have Macierewicz speak. The Center for the Study of Statesmanship, an organization founded at CUA in early 2017, promotes “research, teaching, and public discussion about the meaning of statesmanship and how it can defuse conflict and foster respectful foreign and domestic relations”. This public discussion was embraced by the nearly two hundred students, faculty, and staff that came to the event despite, or perhaps because of, Macierewicz’s controversial background. It is very dangerous to provide a platform that enhances the legitimacy and authority of those whose message proclaims denial of accountability for the Shoah and whose Antisemitism threatens harmony in a world community still scarred and struggling with racism. But that Catholic University affords such a platform today to one whose political energy and populist support amplifies such a message makes sense given the mixed history of the Church. In such evidence as enabling the overthrow of democracy by fascists in Spain, in the Concordat with Hitler and the Third Reich, and in the ongoing tendency of some to silence in the context of extremely violent suppression of the poor and indigenous of our hemisphere under the rubric of anti-communism we know the Church has struggles to maintain integrity when tempted by worldly power, wealth, and security. However, as my grandfather found, our Catholicism also affords us with the means to find harmony in dissonance, to forgive, and to build the kind of polity which affords sustainable social justice, a movement now being nurtured even at the highest levels within the Vatican. So there were almost 200 people at this event and the reporter didn’t bother getting any reactions from the crowd? Or quotes from the administrators who were present in the room and presumably approved it? All we get is an anonymous comment from an unnamed source and an email from the son of a former professor who taught at CUA in the 1960s. Thank you for an informative, thoughtful, carefully researched article about a representative of an odious hard-right political party that (barely disguised anti-Semitism and anti-refugee sentiments aside) has been heedlessly turning its back on NATO and the E.U. while embracing a dangerous form of hyper-nationalist authoritarianism. I had the good fortune to teach in Poland in 2002-2003 and have the warmest regard for its people, history, and culture. That wonderful experience gives me all the more reason to lament the nation’s backward slide into an anti-democratic posture. Reprehensible that a Catholic university or any serious place of learning would let itself be used this way, and would give a platform to such an ignominious character just because he vaunts himself as a good Catholic. Utterly disgraceful.